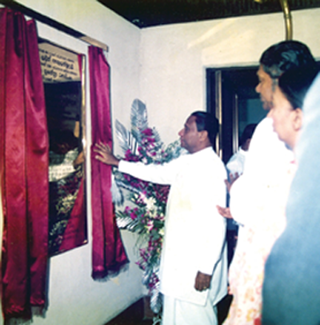 The National Library of Sri Lanka was inaugurated on 27th April 1990 by HE Ranasinghe Premadasa, then President of the Democratic Socialist Republic of Sri Lanka. This event marks a significant step in the country’s educational, cultural, library and information fields. The Ceylon National Library Services Board Act No.17 of 1970 provided the legal base for the National Library at its initial period. The National Library and Document Services Board new amendment Act No. 51 was introduced in 1998. Powers and responsibilities of the National Library were clearly spelled out for the first time and this was a fulfillment of a long felt need. It has become a herculean task to organize and introduce this new institution to the country and to the general public.